Traverse City has long been one of my favorite getaway spots. My family and I spent many vacations in the northern Michigan town, enjoying the beautiful beaches on Grand Traverse Bay, charming shops, good food and wonderful wineries. Justin and I also enjoy visiting the fun town together, made even better because two of our wonderful friends live there. So it’s always a great excuse to drive north to visit and play. Life continues to move quickly by so it unfortunately had been much too long between visits with Steve and Lucy, and their beautiful little daughter. But we made up for it with lots of talking, laughs and good times. We got a late start on Friday so when we arrived, so it was quick hugs and catching up before heading to bed. Steve and Justin woke early to head to a small local lake to kayak, while Lucy, their daughter and I played and had some girl talk. It was Justin’s first time kayaking. He learned some great tips and enjoyed the experience. Then we piled into the van and headed to one of our favorite northern restaurants, the Jolly Pumpkin, on Old Mission Peninsula. I’ve referenced this restaurant in a previous blog so I won’t spend tons of time on it again. Needless to say, we enjoyed some delicious food and beverages. Next stop was Peninsula Cellars’ tasting room, which is located in a converted one room schoolhouse originally built around 1896. Many features of the old schoolhouse are still there. Our assignment was to purchase Homework, a delicious red wine. My sister loves this flavorful wine and we can’t find it downstate so we picked up some bottles. The winery also serves Detention, another great selection. Then we hit the streets of downtown Traverse City. There are some great shops with distinct wares. Our mission, however, was Leaping Lizard, a quaint store that carries an eclectic array of gifts and house items. I usually wander slowly through this store but this day I just wanted a moose. Justin and I love the unique and fun sculptures created by Yardbirds. Each sculpture is created from recycled metal items, such as farm tools, car parts, mufflers and bike parts. They come in all sizes and shapes, from a small cat to a “hiking” dog to a squirrel. Some are functional (dog dish, wine caddy), desk decorations or yard visitors. Years ago, I purchased a fabulous horse sculpture made from a horse shoe (naturally) and random other metal parts. 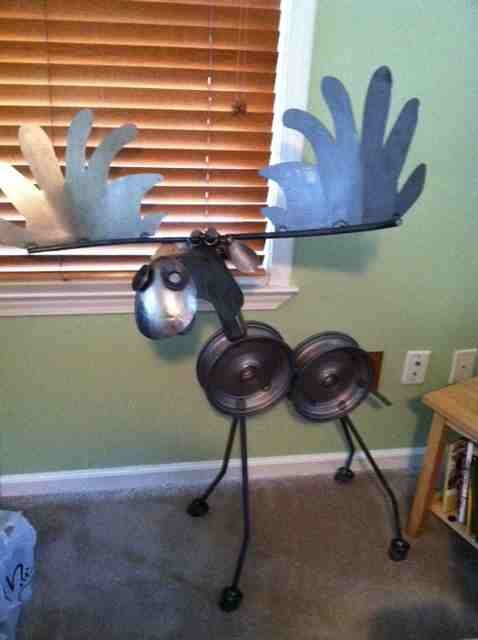 Justin and I spotted a large moose sculpture at an art fair a while ago and kicked ourselves for not purchasing it then. These are sold in limited stores so luck would have it that Leaping Lizard in Traverse City carries them and happened to have a large moose. Our first joint purchase of art! The rest of the day was spent hanging out with our friends at their home, enjoying a yummy Mexican dinner, drinks, bonfire, s’mores and friendship. After a great breakfast on Sunday, we headed to Leelanau Peninsula to check out Longview Winery, another winery creating one of our favorite wines not carried near home. Their 2010 Rustic White is, quite simply, amazing. It’s light and fruity and just incredibly tasteful (their website describes it as a fruit bomb!). 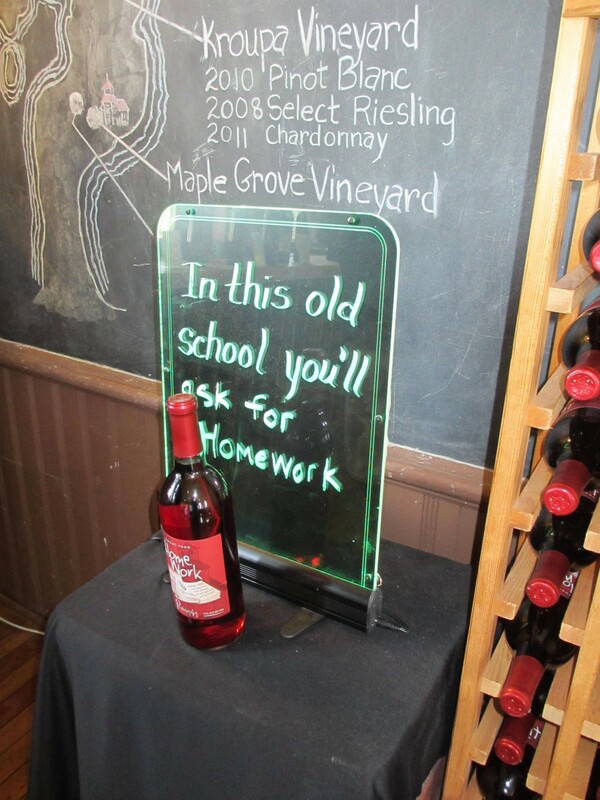 Every time we serve this wine, it’s a hit. We were disappointed to learn that Longview had recently sold out of their cherry wine. The early warm spell and then frost this spring will definitely put a damper on the usually delicious cherry wines found in this area’s wineries. Our final stop was at Chateau Fontaine located on French Road. This winery has always been a favorite of our friends so it’s a regular on the winery circuit. And there’s good reason it’s a favorite. The customer service is fabulous every time we’re there. The staff is incredibly knowledgeable and friendly. The tasting room is cozy and an adorable dog wanders through the room every so often. And did I mention the wine is great? The winery opened in the 1970’s and has won countless awards for most of their wines. We like a lot of their wines, but our top choice today was their Cherry Wine. Knowing that next year’s selection will be slim, we purchased several bottles to last, as well as a mix for an amazing chardonnay and cilantro cheese ball. As I mentioned, Traverse City is always one of our favorite northern Michigan places to visit. We love the variety of fun activities, great food available, novelty of so many excellent wineries, and best of all, spending time with great friends. This was definitely another fun (albeit whirlwind) weekend getaway to add to our book of memories. The next adventure will be here soon enough! Thanks for reading! Traverse City is definitely one of my favorite Michigan spots. So much fun stuff to do and places to visit! Makes me wanna go!! Thanks for sharing.